Mercedes driver Lewis Hamilton put in a grand slam performance in the Canadian Grand Prix, taking the pole with a lap record, leading every lap of the race, and setting the fastest lap of the race with another lap record. How did he do it? In Monaco, the Mercedes drivers had difficulties getting their tires to operate in a narrow window of optimum temperatures. The team had topped those problems by Montreal. "For the team to have come away from Monaco," Hamilton said, "everyone kind scratching their heads but everyone wanting to work, to pull together, which we did, I don't think in the five years I've been with the team that I've seen them pull so well together and really work towards the same cause. Understand the car and then come here and deliver what we've delivered - a great blow to the Ferraris." Pole position is always the prime place to start a Formula 1 race, especially this year when the new regulations have made overtaking more difficult than ever. Hamilton won the pole. Actually, the Canadian circuit does not have a very good record of drivers converting poles to wins, but was the case this time around. By being out front, Hamilton avoided any dramas in the first bends. 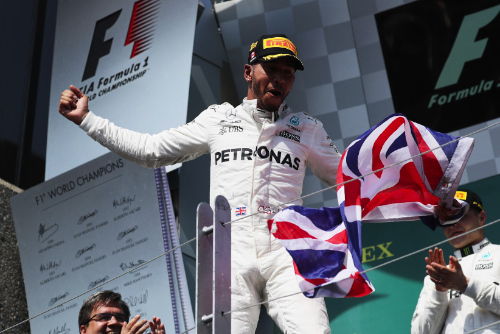 Hamilton qualified on pole with a record lap of 1:11.459. "Valtteri [Bottas] certainly was not on Lewis' pace," Daniel Ricciardo commented after qualifying. "The 11.4 was strong. For sure Lewis likes this track, he has had a lot of success here, so when it is a track that you enjoy you can extract another tenth. That was a good lap. They are strong,"
The Safety Car had been deployed 11 times in the last 19 races in Canada, and it came out for the 12th time in the 2017 edition of the race. But that was for the first three laps after the Carlos Sainz/Felipe Massa accident, and thus it was way too early for any of the front running drivers and teams to use the Safety Car period to try an alternative strategy. Max Verstappen made a brilliant start as he sliced his way from fifth to second in his Red Bull, but in the process, he chopped across Sebastian Vettel's front wing. Vettel, who had qualified second, had to pit for a new nose, and that ended any chance he might have had of challenging Hamilton for the victory. Verstappen ran second. There was no way the Red Bull had the speed to challenge the Mercedes, but Verstappen was still in line for a podium finish when his car's batteries failed after just 10 laps. Hamilton stayed out on the Pirelli ultra soft compound slicks until the end of lap 31. That was a full 10 laps longer than the team had planned. "I was quite comfortable on the ultra soft," Hamilton said, "and they kept me out way longer than my stop, which was to be lap 21. In that period of time everyone had stopped behind me and I was able to wait a bit to see how everyone was doing on the different tires because and after they had seen one of the drivers on the super soft and it was going well." In second place on lap 11, Bottas had no answer for Hamilton's speed. "In the beginning it was tough being behind the Red Bull, and then I was stuck behind one of the Force Indias for some time there," Bottas said. "I knew what I had to do to bring the car home." By going from 18th after his early pit stop to fourth, Vettel picked up 12 points. True, Hamilton's 25 points closed the gap by 13 points on championship leader Vettel, but it could have been much worse for Vettel after that unscheduled pit visit.